Russian President Vladimir Putin said Thursday that the current international situation makes a strong nuclear deterrent essential for protecting national security. Speaking at a meeting with officials on nuclear weapons programs, Putin said that the government would make sure that the nation has enough nuclear warheads. "The analysis of the current international situation and the perspectives of its development prompt Russia to consider the nuclear deterrent as the main element guaranteeing its security," Putin said in televised remarks at the start of the meeting. "Maintaining a minimally sufficient number of nuclear weapons that ensure nuclear deterrence remains one of the most important policy priorities," he said. In May 2002, Putin and U.S. President George W. Bush signed a treaty that obliged both sides to cut their strategic nuclear arsenals by about two-thirds, to 1,700 to 2,200 warheads, by 2012, but allowed them a choice between scrapping or stockpiling the decommissioned weapons. When the treaty was signed, many analysts said that the number of Russian nuclear weapons could fall far below the number set by the treaty, but soaring global oil prices brought Russia a steady flow of dollars in the following years, allowing the Kremlin to bolster defense spending. 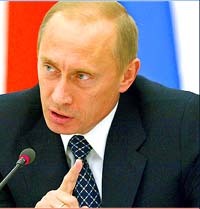 Putin said Thursday that the government was mulling over details of its weapons program for 2007-2015. "All options are being considered taking into account the state potential," he said. He didn't give further details in his opening statement, and the meeting continued behind closed doors. Russia's relations with the United States have worsened over recent years amid differences over the war in Iraq and other global crises and U.S. concerns over the Kremlin's backtracking on democracy under Putin. Russia, in turn, has been concerned over NATO's eastward expansion and criticized U.S. plans to deploy missile defense as damaging global stability. Putin repeatedly boasted that Russia had designed a new weapon capable of penetrating any prospective missile defenses a clear reference to the prospective U.S. missile shield, reports AP.